Jefferson recorded purchasing a candle box in his daily account book. Our handcrafted mahogany box is decorated with a solid brass medallion and gold tassel. 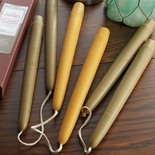 7 1/2" h x 12"l x 5"d. Fill it with TV remotes, desktop clutter or our hand-dipped boxed pair of candles, sold separately, made from genuine beeswax or the wax on the berries of the bayberry shrub. 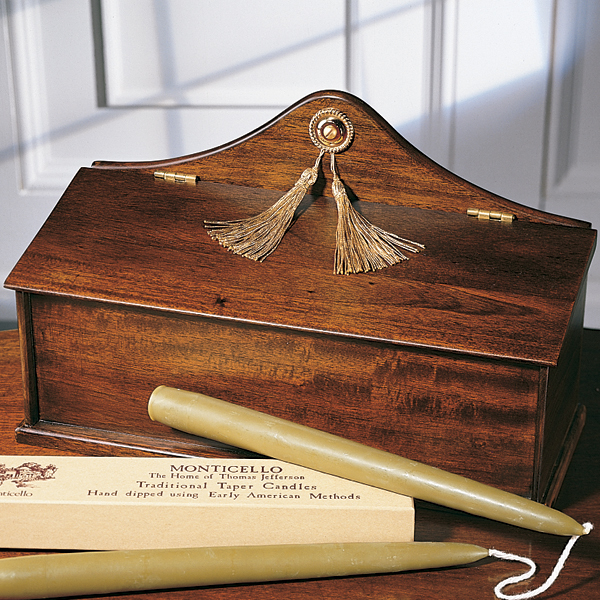 Candles are made in the U.S.A. Bayberry is pictured. Until the advent of electric lights, most people found sources of artificial light expensive or even a luxury for their homes. 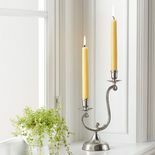 Candles were the most widespread form of illumination in America until the end of the eighteenth century and were part of everyday life. All manner of accessories such as candleholders, candle boxes, candle snuffers and extinguishers would be typical items found in a household inventory. 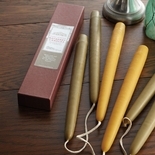 Snuffers, made in a variety of shapes and materials, were scissor-like instruments used for trimming the wicks of candles and lamps. Extinguishers, with cone-shaped caps, were used to put out the candle flame. After Thomas Jefferson�s death on 1826, a household inventory listed twenty-six candlesticks and candelabra of silver plate, brass and japanned metal.